- Made up of size: 2"x3"
To avail the demand of our clients, our company is involved in offering a wide range of Hockey Goal Post. 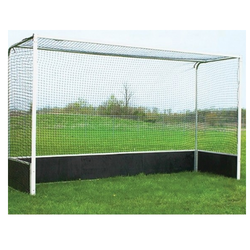 We are leading Manfacturer and Suppliers of Hockey Goal Post Portable & Non Portable. - Main frame made of 3 x 1.5 rectangular, 2 mm thick GI Pipe. - Comes with 4 nos of heavy duty fibre wheel each 4 inch dia with stopper. - All 3 side of bottom base is covered with 1 thick marine ply to a height of 1 feet.